Sudbury-based violinist Christian Robinson has an extremely active career as a chamber musician and orchestral leader. His chamber music activities have seen him perform in feature concerts at many of Canada’s premier festivals, including the Guelph Spring Festival, Festival of the Sound, the Banff Summer Arts Festival, QuartetFest, and the Ottawa International Jazz Festival. In 2004 he co-founded the Silver Birch String Quartet, which continues to be one of Canada’s most active young quartets, with concerts throughout the country. He co-produced the SBSQ’s first commercial recording on Montreal’s Effendi record label in collaboration with the acclaimed young jazz-pianist John Roney, which was nominated for both a 2010 JUNO Award, and a Felix Award in the province of Quebec. His chamber music performances with the SBSQ and in other configurations are frequently broadcast nationally on CBC Radio 2, and Espace Musique. His contemporary music collaborations include work with Earshot Concerts at the Music Gallery Toronto, Soundstreams Canada for CBC at the Glenn Gould Studio, and Sudbury’s 5-Penny New Music Concerts. 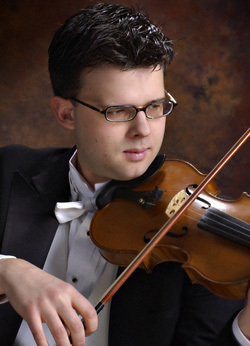 He serves as Concertmaster for the Sudbury and North Bay Symphony Orchestras in Ontario, and in 2010 gave the world-premiere performance of Et une porte d’ombre se referme, a violin concerto commissioned by the Sudbury Symphony Orchestra for him from Robert Lemay through a grant from the Ontario Arts Council. Christian performs exclusively on an instrument completed in 1993 by Masa Inokuchi of Toronto.